20081104_Chicago_IL_ElectionNight1258 | Flickr - Photo Sharing! ticonoscoit / Marics Timea, Vox Efx, and 1127 other people added this photo to their favorites. I love the crop of this one, it really captures the special moment! Open debate : could we alterate (a little) the truth for improve aesthetic ??? @ L'album de Georges : clearly, it's a different photo. @ L'album de Georges: It doesn't appear PS'd. It's a different shot from a lower perspective. You can see the very top of the other sitting guy's head just above Barack's. It looks like he was praying for victory. This picture seems to capture the tone of his campaign which was hope for the future. Wonderful pic! 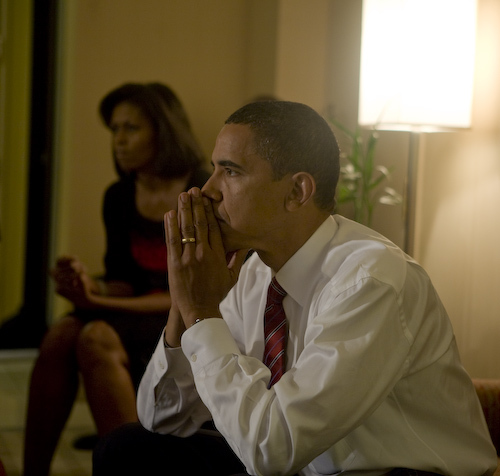 Mr. and Mrs. Obama you are not alone with your anticipation my heart is in both of your clenched hands..God Bless America! Have my deepest condolence for the death of "Tutu". He raised a son to free the world. Let light perpetual shine on her. He looks so somber, like it sunk in what a difficult job he's just inherited. The weight of the world are on his shoulders. This picture of the elected president of the USA reflects so many things. Nobody can say what he was thinking about at that particular moment in time. One can imagine the feeling of being the winner of something big and important but never at that level, with that massive victory and with the task that stands in front of him. I see preoccupation, I see stress too, but the ensemble gives me hope. Call me stupid if you want but I see a man I can trust. For all you Americans, I say, well done and congratulations! May we live up to the call of our President and become the nation we are to be. The Dictionary is the only place where SUCESS cames before WORK. Congratulations Mr Obama. Congratulations for your great family, for being a father, husband, son, and having time to help us make the world a better day. Thinking about how he's going to have to clean up Bush's mess.